Resorts World Sentosa offers Lightseeker pre-theatre dining at some of its iconic restaurants. 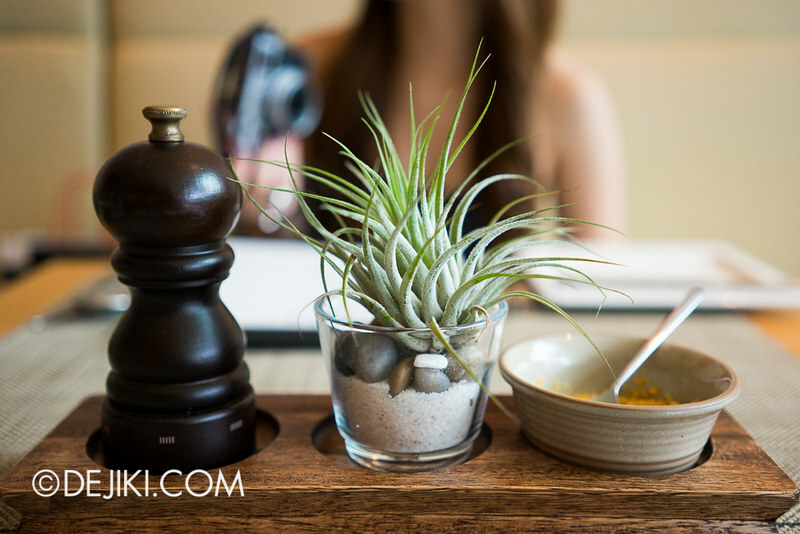 Step into Osia and have a look at what this award-winning restaurant as to offer. Osia is located at the Festive Walk section of Resorts World Sentosa. It’s a short walk away from the RWS Theatre. The Lightseeker menu ($58++) contains some of Osia’s signature dishes. There are four choices for the main course. I’m not a foodie (otherwise this blog would’ve been 100% on food), but of course, I enjoy good food and photographing about it. It might be odd to say this, but this pre-theatre meal at Osia was much more memorable than the show itself. 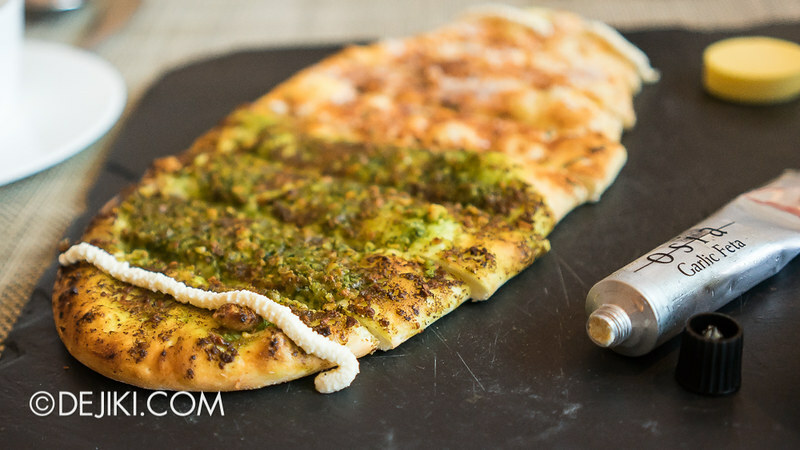 We started with Osia’s two-in-one flatbread, with a tube of the house’s garlic feta. It certainly started our dinner with a burst of flavours. One side is filled with macadamia pesto, and the other a sauce of truffle and olive. 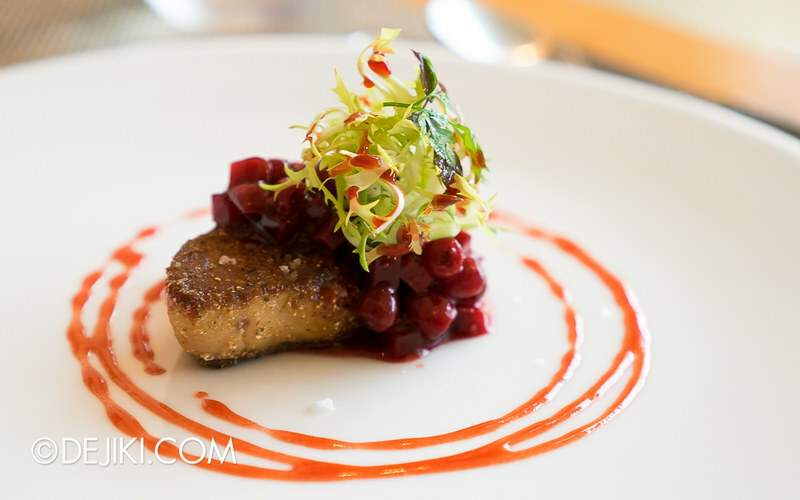 Then came the Polenta Crumbed Foie Gras – a rich slab of foie gras with rhubarb, beet and riberry. 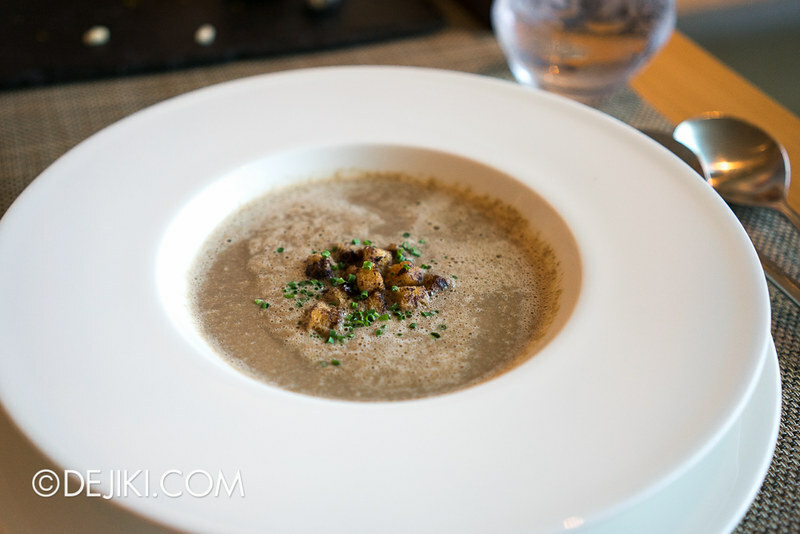 Emulsion of Field Mushroom – a light, slightly frothy, mushroom soup. 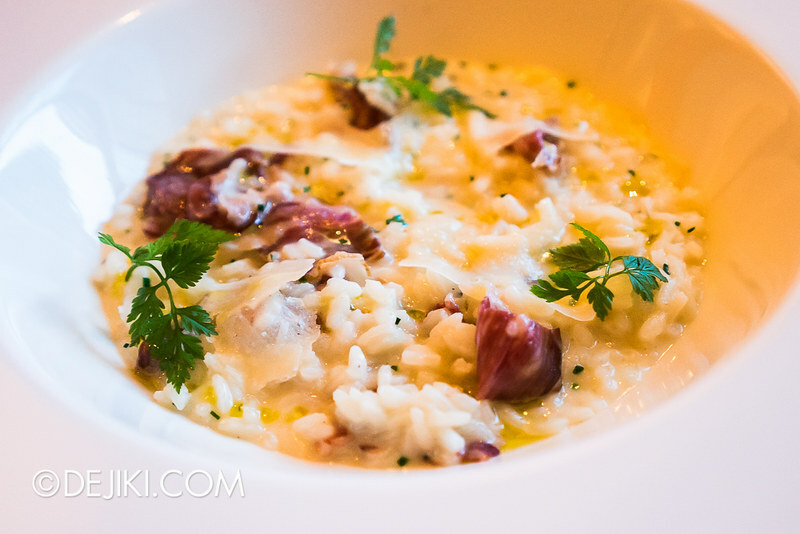 I never pass up on Risotto when I have the chance. Why? Because I taught myself to cook Risotto. The Air Dried Wagyu Beef Brisket Risotti was strong and rather overwhelming – the salty flavour of the beef and thick shavings of Parmesan topped a creamy base. 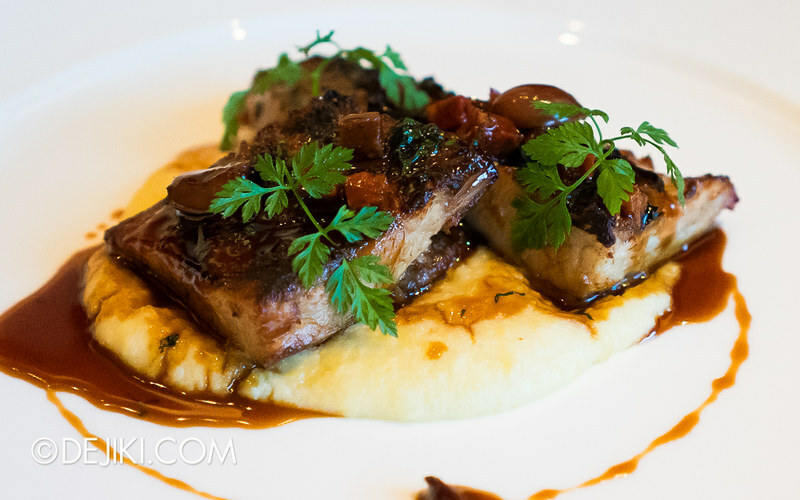 My sister ordered the Braised Pork Cheeks served with Apple Polenta and a Choriza Olive sauce. A personal recommendation from the staff, this sinful entree was very rich and fulfilling. Thankfully, it didn’t leave an oily aftertaste. 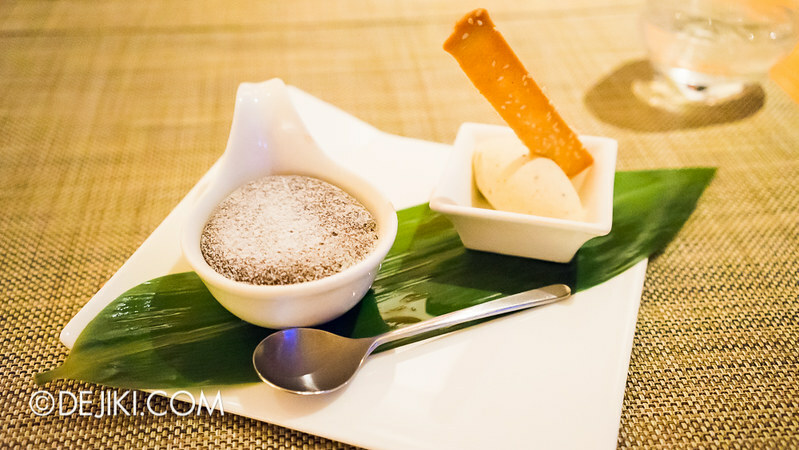 Lastly, Valrhona Chocolate Soup – an Osia signature. This dessert presented a dance of fragrances between peppered vanilla ice-cream and a smooth, generous serving of Valrhona chocolate. Osia operates with an open kitchen. In this photo, Chef Douglas Tay can be seen in the background. 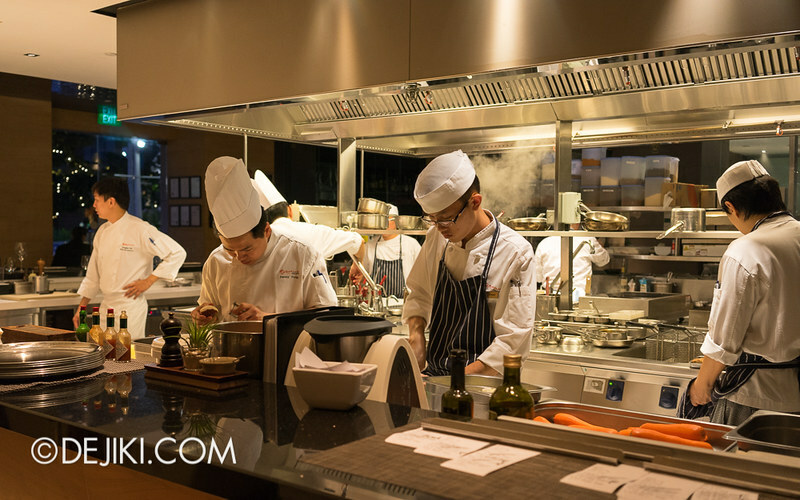 As Osia is part of the Crockfords Tower section of RWS, expect top-notch service to be paired with its rich contemporary cuisine. The staff were very attentive, checking with us during dinner and making sure that the courses came out promptly. 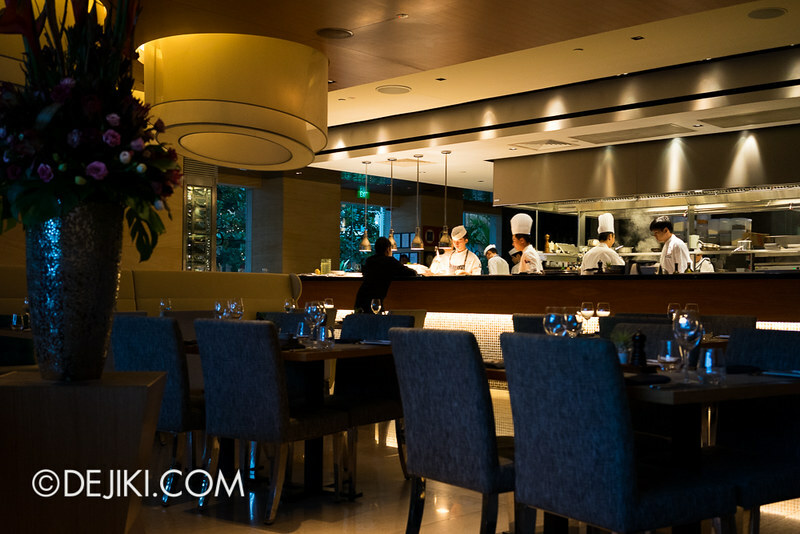 It’s a splurge dinner experience, but I’ll definitely want to revisit Osia for those special occasions. 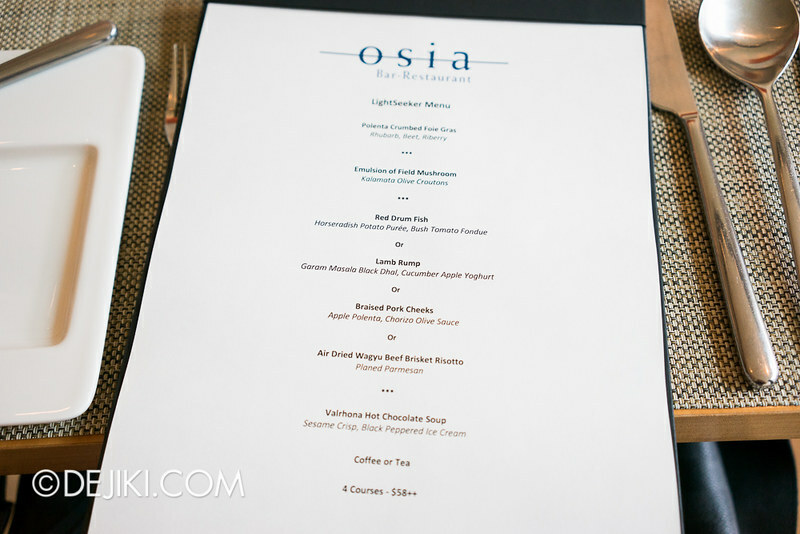 The Osia LightSeeker menu is a 4-course set ($58++). With Lightseeker starting at 8pm, it’s probably best to be at the restaurant 2 hours before to enjoy the meal to its fullest. Thanks to RWS for inviting us to experience the Lightseeker Menu at Osia.